Mera Peak (6654m.) which is situated in the Everest region is the most popular and highest official trekking peak in Nepal. This peak linked with the remote Hinku and Hunku valley which offers the exceptional Himalayan panoramic view of the five world's 8000 meter peaks, Mt. Everest, Lhotse, Makalu, Cho Oyo and Kanchenjunga. 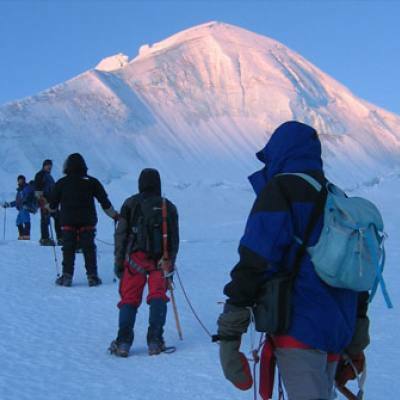 Mera peak climbing is challenging and adventurous which is technically straightforward and physically demanding. It requires the strong physical fitness and a sense of adventure in the climbers. While climbing the summit of Mera Peak, you can have the most spectacular view of entire Himalayan ranges of the Everest region. 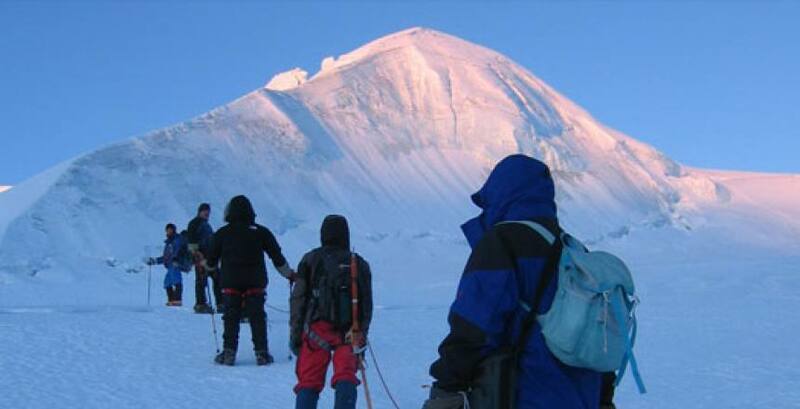 This climbing and trekking takes you through the undamaged trail of the Everest region. The remote and untouched Hinku and Hunku valley provides you the unique experience which will be the lifetime memory. 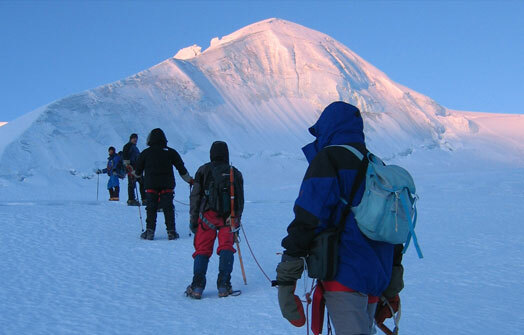 On the way to the Mera peak you enjoy the natural and cultural beauty of the Everest region. The journey to the Mera peak starts from Lukla after the 30 minutes scenic flight from Kathmandu. During the trek you walk through the undamaged hill with dense forest which provides you the wilderness experience of the Everest region. en route you traverse through the dense forest of Rhododendron and pine forest, remote ethnic settlement of Sherpa people and other group, terraced farming, valleys enjoying the beauty of the nature and amazing view of mountains. On the way to the base camp you can explore various flora and fauna and encounter wild animals and birds like sloth bear and jungle cat if you are lucky. From the base camp the peak can be climb in one day but it is better to set high camp to enjoy the panoramic view of the mountains. The best seasons to go for Mera Peak climbing are spring and autumn. Day 03Flight to Lukla and trek to Puiyan (2800m.) In the morning you have a scenic flight to Lukla (2800m.) from Kathmandu. It takes 30-40 minutes to reach Lukla. Then you start your trek and head to Puiyan. We descend down and walk through the jungle to Surke. After having lunch there we continue our walk through the traditional villages, jungles, and hills, and finally we reach the Puiyan. Day 04Puiyan to Pangkongma (2,850m.) This day at first we walk little down for some time and cross the wooden bridge then head to Kari La Hill (pass). We walk up through the rhododendron and bamboo forests. We can see the outstanding views of Dudhkoshi River valley and Dudh Kund Himal before reaching the farming and trading village of Pangkongama. Day 05Pangkongma to Nigmsa (2745m.) From Pangkongma we descend down in the rocky path leading to the rhododendron forest. We pass through a lot of Mani walls as well as we cross hills, ridges, and teahouses. 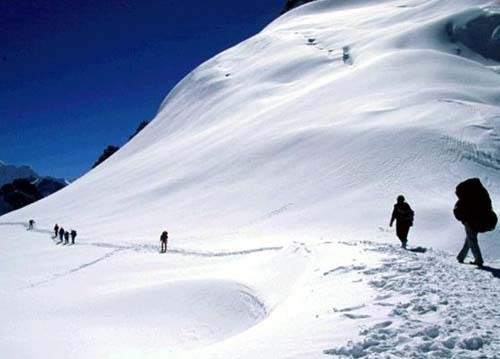 We see the thrilling views of the south face of Mera Peak (6064m./19890) and Naulekh Peak. Day 07Chhatra Khola to Kothe (3600m.) Today we head to the vantage point of Hinku valley. Walking straight through the forest of bamboo and pine we enjoy the views of Mera and the Hinku Valley. We continue walking on the ridge of the river in the Hinku valley all the way up and reach Kothe. Day 08Kothe to Tangnang (4,350m.) This day also we walk along the ridge of the Hinku Khola enjoying the view of the Mera peak. We pass through the Gondishung, a summer herders' settlement in the west bank of the Hinku Drangka. From there we walk for some time and reach Thagnang, which is a summer grazing area with the primitive lodges and shops. Day 09Rest in Tangnang This day we take rest for the proper acclimatization. Day 10Tangnang to Khare (5,045m.) This day we left Tangnang and follow the lateral moraine of Dig Glacier to Dig Kharka. We climb through the moraines and then climb more steeply to Khare where we stay overnight. Day 11Khare to Mera Base Camp (5300m.) This day we head to the Base camp of the Mera peak which takes ¾ hours. We have to walk through the steep path. Day 12Base camp to High camp From base camp we ascend to the High camp. it takes 2/3 hours to reach high camp from the base camp. Day 13Summit Mera peak and return back to Base camp This day we climb the Mera peak. From the summit we can enjoy the excellent view of the five world's 8000 meter peaks, Mt. Everest, Lhotse, Makalu, Cho Oyo and Kanchenjunga. Then we descend down to the base camp. Day 14Base camp to Tangnang We retrace our route to Tangnang. Day 15Tangnang to Mousum Kharka From Tangnang we return back to mousum Kharka following the previous route. Day 16Mousum Kharka to Thuli Kharka This day also we retrace our previous route. On the way we pass through the forest of rhododendron and pine and cross small Sherpa settlement. Day 17Thuli Kharka to Lukla This is the last day of our walking. We return to Lukla from where we started our trek. Day 18Flight to Kathmandu Early in the morning we take flight back to Kathmandu.